Grill grates are obviously one of the most important of all grill accessories. Without a grate, you have nowhere to put your food! Fortunately for us, most grills come with a perfectly serviceable grate that is perfect for that grill. However, different types of grates have different advantages or disadvantages. Most grill companies carry a full line of replacement grates for their grills. 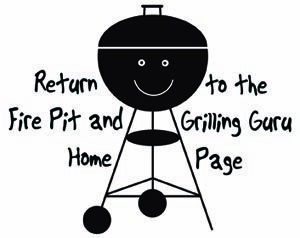 If you are trying to grill on a fire pit or campfire or need a replacement grate, I also have some suggestions below. Material Type: The most common grate material is stainless steel. 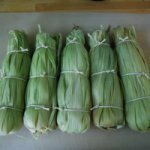 It is a good all around choice as it seasons ok, resists sticking (assuming you treat it well and clean it after uses) and conducts heat relatively well. However, if available, cast iron grates are quite a nice upgrade. If you season them well and clean them and oil them after each use, they become practically indestructible and will last forever. After seasoned, they resist sticking very well. But best of all, cast iron conducts, holds and distributes heat better than anything. Not to mention that it leaches a bit of iron into your food which helps support your dietary need for iron! Lastly, you often see enameled grill grates which are blackish, coated metal. These are pretty good at reducing sticking of food but they can be difficult to clean. Never use a metal bristled brush to clean enameled grates because it will scratch the enamel. Once the enamel is damaged, food will stick much more readily. Only use hair or other stiff, non-metal bristled brushes to clean these grates. Shape: Grills are generally either round or rectangular. There is nothing particularly better about one size than the other. 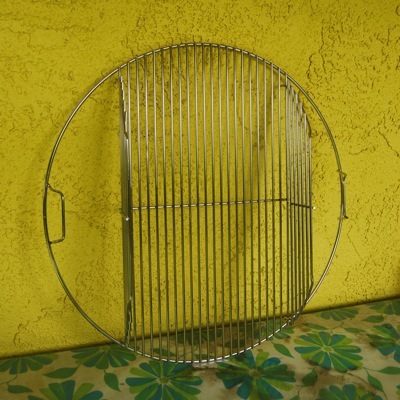 Obviously, if you have a round grill, you need a round grill grate. In terms of size, the total square inches of cooking surface is the most important thing to look for when buying a grill or grate. One thing to keep in mind if you are intending to use a grate over a fire pit. While most fire pits are round, I'd encourage you to consider a rectangular grate. This leaves openings on either side of the grate so that you can tend the fire while you are cooking. Hinged: Many grill companies (such as Weber) make grates that have hinged sections on one or both sides (such as the one seen above). 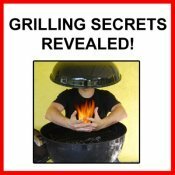 This allows you to open the grill to tend the charcoal to move it around, add coals, or add smoking wood while there is food on the grate. This makes it a lot easier if you are cooking for a prolonged period of time and need to occasionally add or adjust your fuel. As I said above, grills come with the appropriate grate. However, there are some circumstances that you may want to find a new grate. For example, if you have an old grill and the grate has become rusted or overly crusted with old food to the point that it is no longer serviceable. Likewise, you may want to upgrade to a grate of a different material or with a hinge. The first place I'd recommend you look is from the same company that made your grill. There you are most likely to find an exact match that fits your grill perfectly. Many produce different grills that have different material or have a hinged grate. For example, a nice upgrade to a basic Weber kettle grill is to add the Weber hinged grate that opens on both sides. For the bigger producers like Weber and CharBroil, you can often find a selection of replacement grill and charcoal grates in stores where the grills are sold (such as Home Depot, Lowe's, barbecue retailers, etc.). If all else fails, contact the company directly and ask them what replacement grates they sell and where to get them. If you have a grill or fire pit that you want to get a grate for, you have a couple options. The easiest is to check the stock of replacement grates you can find at a local grill retailer to see if one is a suitable size to fit on your fire pit or grill. As I said above, sometimes a rectangular grate is a perfectly good option for a round fire pit, assuming it spans the pit and sits securely on top. If all else fails and you cannot find a grate that will fit, try to find a local metal worker. It is relatively easy for an experienced metal worker to build a grate to your specifications out of cast or wrought iron or stainless steel. 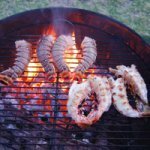 Done with the Grill Grates page? Return to the Grill Accessories section.